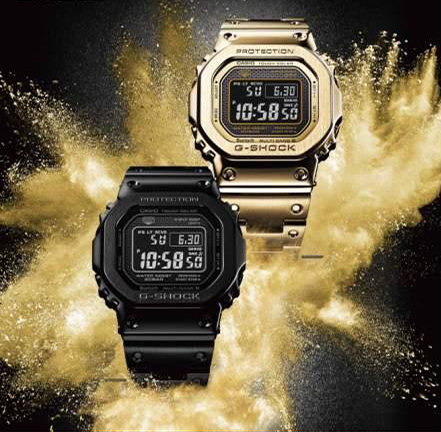 DOVER, NEW JERSEY, OCTOBER 10, 2018 - Today, G-SHOCKunveils the two newest additions to its upscale Full Metal 5000 collection. First introduced in March 2018, the collection will now include a sleek all-black color way (GMWB5000GD-1), as well as an updated all-gold model (GMWB5000GD-9). Featuring the iconic square shaped bezel and brick pattern on the face, the timepieces are inspired by the original DW5000 case design. Boasting premium features such as Tough Solar Technology – rendering it capable of self-charging even with low sun exposure, the new Full Metal 5000 Collection also includes G-SHOCK’s Multi-Band 6 technology and Bluetooth® connectivity for two-way time sync functionality. The two models incorporate full stainless-steel housing for a modern, sleek aesthetic. The collection also features super illuminator LED light with a unique fade-in & fade-out function, as well as an updated negative STN LCD display. The GMWB5000GD-9 also features a brushed hairline metal finish on the bezel, a mirror case and a matte finish on the band. The GMWB5000GD-1 and GMWB5000GD-9 will retail for $550 and will be available for purchase beginning in November 2018 at G-SHOCK retailers including select jewelers, select Macy’s, the G-SHOCK Soho Store, and gshock.com.